Kids bring all kinds of things home from school with them. Report cards, projects, books … and head lice. School season means head lice season, and your kids might be at risk. Take a look at this article to find out how you can get rid of lice, and keep them out of your home for good. If your child has been sent home from school with head lice, don’t panic. Although these wingless parasites will cause your child's head to itch, they aren't actually dangerous and they can't spread any kind of disease. The one thing to watch out for is a possible bacterial infection. 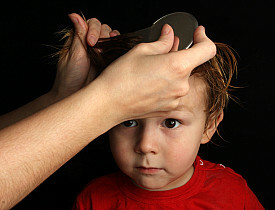 Children with sensitive scalps may develop a rash, while other children might not even itch much at all. If a small red rash appears on your child's head, take your child to a doctor. If a rash has occurred, your family doctor will prescribe oral antibiotics. It's true that lice can't fly, but they can crawl. Lice have claws that allow them to cling to piece of hair with amazing strength and to climb from one person to another. Since children often play closely with one another (and share lots of things), lice are more apt to attack children than adults. Teach your kids to avoid sharing hats, hairbrushes, hairbands, clothing, linens, towels, and similar personal items – especially those that come into regular contact with the head and hair. The good news is that while lice are able to claw their way from one person to the next, they can't attach themselves to pets. Lotion, cream rinse, or medicated shampoo can be obtained by visiting your child's family doctor. While some over-the-counter remedies do exist, it's best to speak with a medical expert. This way, the type of lice infestation that your child is dealing with can be eradicated right away. Once you have obtained the proper treatment, it's important that you follow a product's directions carefully. Most lice treatments are nothing short of insecticides, which means that overusing a product can cause serious irritation. But, don't worry -- all of these products are easy to use. Purchase a fine-toothed comb that is to be used only for head lice. Wash and condition your child's hair -- do not dry. Seat your child in a chair, and place a large towel on the floor below. Comb through your child's hair as thoroughly as possible. Lice die almost immediately after being removed from hair, so there's no need to worry about fallen lice crawling around. Still, you should wash the towel that you have used, directly after you remove lice. Wash in hot water any towels, sheets, blankets, clothing, hats, and backpacks that have been used by the infected person. Dry-clean or hand wash items such as stuffed toys or throw pillows, which are not washing machine safe. Or store them in plastic bags for 48 hours. Vacuum fabric upholstery and carpets inside your home and your car. Cover upholstery with a cloth for 48 hours. Place any haircare items (brushes, barrettes, clips) in a bath of hot water filled with rubbing alcohol. Since lice can crawl from person to person, all members of your household should be checked and if necessary, treated for lice. Obviously, instruct everyone to avoid head-to-head or hair-to-hair contact, too. Hair Dryers: do not use a hair dryer on any child who has recently been treated with medicated lice shampoo. These medications can be extremely flammable. Mixing Medications: avoid using more than one lice medication at the same time. Washing Hair: wait a couple of days after a lice treatment before washing your child's hair with regular shampoo. Getting Depressed: don't fret about feeling dirty -- lice have nothing to do how clean (or otherwise) your house is! To try and avoid lice in the future, teach every member of your family not to share hair care items with other people. Most of the time, lice infestation is unavoidable. Still, it never hurts to share as much information about lice with your family as you can -- sometimes, prevention is the best possible course of action! Although head lice is a fairly easy problem to take care of yourself, call a pest control professional to get rid of poisonous or disease-carrying pests, such as spiders, rats, or mosquitoes.